Three months before the Colts official season starts, fans were offered a preview of what the Colts will look like this coming fall. On Wednesday, Lucas Oil Stadium hosted a free open house and Mini Camp for enthusiastic football lovers. With so many new and some what controversial selections, Colts fans were excited to get their first glimpse into which players could catch, like new Colt Duron Carter. Which players run, like Frank Gore, and which players they could get their picture taken with. One fan held up a sign saying he traveled some thousand of miles to get all the Colts signatures. At the end of practice, as the players were exiting, he was only missing one signature, Andrew Luck’s. One of Luck’s teammates nudged him, and told him about the guy who had traveled so far. So, Luck ran all the way back across the field to add his signature to the super fan’s collection. The Colts separated into different teams to practice after their warm ups. One group ran drills, one group worked on special teams, and another focused on defensive maneuvers. The practice team who caught most of the crowd’s attention, though, was the offense with Luck. Players formed mock teams to practice against each other, so the fans had the opportunity to watch their favorite quarterback in the league pass to some of his many great options in wide receiver, tight end and running back positions. 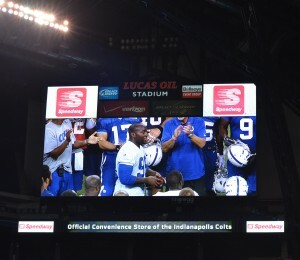 Spectators also got to watch him throw an interception to Colts safety, Mike Adams in what was a spectacular catch. At the tail end of the practice session, Jim Irsay spoke to the Colts players gathered around the fifty yard-line. 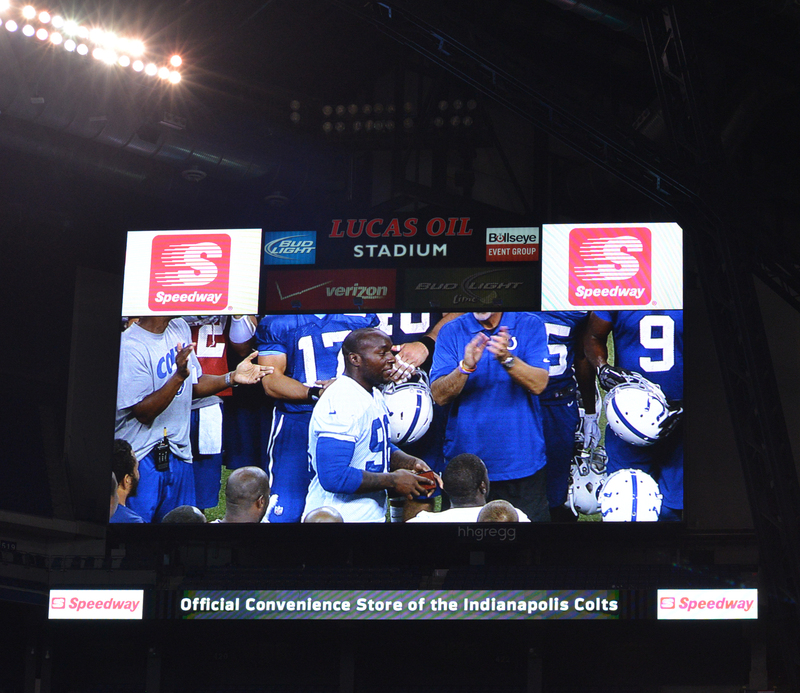 Robert Mathis made a post-achilles injury appearance to accept a watch from Irsay as part of a heartfelt speech given to the players. All the fans left with enthusiasm for the coming season, great photos of the Colts in action, and lots of first-hand experience of what is to come this season.